Tight junctions, also known as Zonula Occludens, are cell-cell adhesion complexes that play a role in the organization of epithelial tissue. 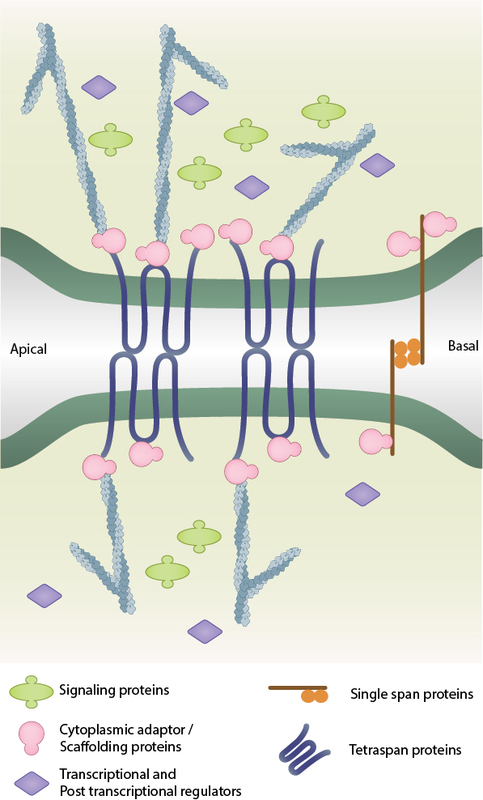 By forming a meshwork of membrane contacts around the cell, tight junctions demarcate the apical region from the basolateral region, thereby serving as a physical barrier within the membrane and contributing to the establishment of cell polarity. Due to the close proximity of each contact, and their interaction with tight junction components of neighbouring cells, these complexes also form paracellular channels that allow the selective diffusion of ions and solutes through the intercellular space. Such a transport of substances through the intercellular space is known as paracellular transport. 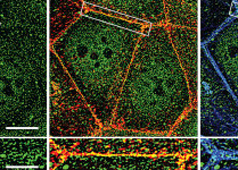 Tight Junctions are predominately formed through interactions between members of the Claudin family of proteins and other transmembrane components such as occludin, tricellulin and junctional adhesion molecules (JAMs). Following the polymerization of claudin strands, the complex is strengthened by a cytoplasmic plaque of scaffolding and adaptor proteins such as the ZO proteins, cingulin, PAR3, PAR6, and MUPP1 . 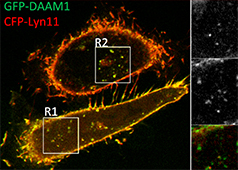 The establishment, maturation and disassembly of tight junctions is regulated by various signaling components including the Rho GTPases, Rho effectors, aPKC and cytoskeletal structures such as actin filaments and microtubules . Using the crystal structure of mouse claudin-15, a model was proposed to explain tight junction formation. In this model claudin-claudin interactions are mediated by beta sheet structures that extend into the extracellular space. Repeated interactions give rise to higher order assemblies of linear polymers with an antiparallel arrangement. Beta-barrel-like pores are then established in the intercellular space and these form the paracellular channels that make tight junctions selectively permeable . The physiological properties of tight junctions depend upon the claudin types expressed. Some claudins are classified as barrier builders, while others are classified as pore formers . For instance, claudins-1, -3, -4, -8, -11, -14 and -19 are known to decrease permeability, thus acting as ‘tightening’ claudins. Other claudin types mediate permeability in a charge- or ion-selective manner. Claudins-2 and -10b display cation-selectivity, whereas claudin-10a increases permeability to small anions . Some examples of ion-selective transport include claudin 16-mediated ca2+ and Mg2+ reabsorption in the renal tubule and claudin 2- and 15-mediated Na+ recycling, which is essential for Na+-dependent nutrient absorption (Na+-glucose co-transport). The barrier function of tight junctions plays a vital role in maintaining the homeostasis within various organ systems. In some cases tight junctions provide a selectively permeable intercellular space. This is found for example in the digestive tract or kidneys, where the intestines and nephrons possess segment-specific permeability within the tubular epithelia that allows for the absorption of nutrients, or clearance of waste respectively. In each case, function is dependent on the different claudins that constitute tight junctions at these sites . In other cases tight junctions ensure a relatively impermeable barrier is established. For example, the function of the blood-brain-barrier, which separates the neuronal layers of the brain from the systemic circulation, is maintained by tight junctions that exist within the brains endothelial cells . Similarly, blood-retinal barriers regulate intraocular microenvironment and are formed by tight junctions within the retinal capillary endothelial cells and retinal pigment epithelial cells . Tight junctions also form relatively impermeable barriers along the skin and bladder epithelia . Dysregulation of the barrier function at distinct regions are known to lead to pathological states such as neuroinflammation and lesions, retinopathy, edema, diarrhea, jaundice, irritable bowel syndrome, gastritis, familial hypomagnesemic hypercalciuria with nephrocalcinosis, dermatitis, metastases and many more . The dense network of tight junction strands along the apical region acts a fence to prevent the mixing up of components between the apical and basolateral surfaces. This is essential for the structural and functional differentiation of the two domains and ultimately leads to cell polarity . Tight junction components, such as the junctional adhesion molecules, also contribute to cell polarity by interacting with Par3/Par6/a-PKC polarity complexes, thereby retaining key cell polarity proteins within the apical domains . 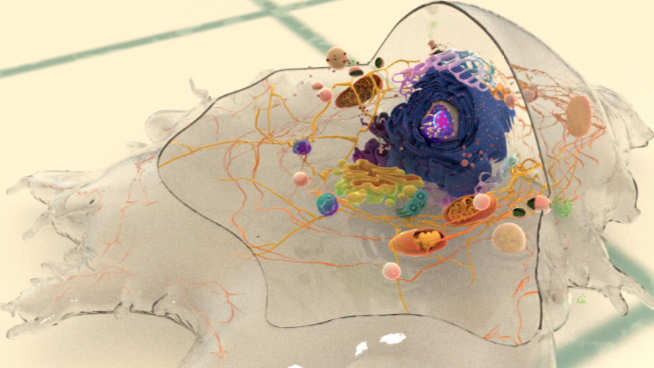 A loss of cell polarity is known to lead to cancer properties within the cell . Furthermore, disrupted regulation of tight junction formation may also impair their overall function.